The Articles of Confederation and Perpetual Union. The Perpetual Union is a feature of the Articles of Confederation and Perpetual Union, which established the United States of America as a national entity. Under modern American constitutional law, this concept means that U.S. states are not permitted to overthrow the U.S. Constitution and withdraw from the Union. A significant step was taken on June 12, 1776, when the Second Continental Congress approved the drafting of the Articles of Confederation, following a similar approval to draft the Declaration of Independence on June 11. The purpose of the former document was not only to define the relationship among the new states but also to stipulate the permanent nature of the new union. Accordingly, Article XIII states that the Union "shall be perpetual". While the process to ratify the Articles began in 1777, the Union only became a legal entity in 1781 when all states had ratified the agreement. The Second Continental Congress approved the Articles for ratification by the sovereign States on November 15, 1777, which occurred during the period from July 1778 to March 1781. The 13th ratification by Maryland was delayed for several years due to conflict of interest with some other states, including the western land claims of Virginia. After Virginia passed a law on January 2, 1781 relinquishing the claims, the path forward was cleared. On February 2, 1781, the Maryland state legislature in Annapolis passed the Act to ratify and on March 1, 1781 the Maryland delegates to the Second Continental Congress in Philadelphia formally signed the agreement. Maryland's final ratification of the Articles of Confederation and perpetual Union established the requisite unanimous consent for the legal creation of the United States of America. There shall be from this day following a Society, a permanent and perpetual Union, between the Sovereigns subscribed." By itself the word perpetual appears much earlier in the history of political thought. In January 44 B.C., Denarii coins were struck with the image of Julius Caesar and the Latin inscription "Caesar Dic(tator in) Perpetuo". From the start the Union has carried with it importance in the national affairs. There was a sense of urgency in completing the legal Union during the American Revolutionary War. Maryland's ratification act stated, "[I]t hath been said that the common enemy is encouraged by this State not acceding to the Confederation, to hope that the union of the sister states may be dissolved" The nature of the Union was hotly debated during a period lasting from the 1830s through the American Civil War. During the American Civil War, the U.S. was called "the Union". By [the Articles of Confederation], the Union was solemnly declared to "be perpetual." And when these Articles were found to be inadequate to the exigencies of the country, the Constitution was ordained "to form a more perfect Union." It is difficult to convey the idea of indissoluble unity more clearly than by these words. What can be indissoluble if a perpetual Union, made more perfect, is not? —  U.S. Supreme Court, Texas v. White (1869). During the ratification of the Constitution, ratifications by New York, Virginia and Rhode Island included language that reserved the right of those states to exit the U.S. federal system if they felt "harmed" by the arrangement. In Virginia's ratification the reservation is stated thus; " the People of Virginia declare and make known that the powers granted under the Constitution being derived from the People of the United States may be resumed by them whensoever the same shall be perverted to their injury or oppression ..."
My opinion is that a reservation of a right to withdraw ... is a conditional ratification ... Compacts must be reciprocal ... The Constitution requires an adoption in toto, and for ever. It has been so adopted by the other States. —  James Madison, letter to Alexander Hamilton (July 20, 1788), emphasis added. Hamilton and John Jay agreed with Madison's view, reserving "a right to withdraw [was] inconsistent with the Constitution, and was no ratification." 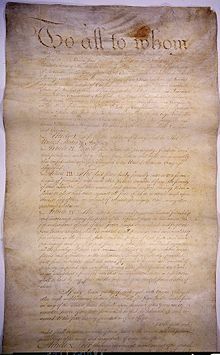 The New York convention ultimately ratified the Constitution without including the "right to withdraw" language proposed by the anti-federalists. Gouverneur Morris, often called the "Penman of the Constitution," by contrast argued during the War of 1812 that States could secede under certain conditions. In his first inaugural address, George Washington referred to an "indissoluble union", and in his farewell address to the country, telling Americans that they should maintain "the security of their union and the advancement of their happiness." In his farewell address, Washington stated that the union of states was "your union and brotherly affection may be perpetual", and in urging Americans to maintain it, stated that "you should properly estimate the immense value of your national Union to your collective and individual happiness." Patrick Henry, shortly before his death, urged Americans not to "split into factions which must destroy that union upon which our existence hangs." Constitutional scholar Kevin Gutzman took an opposing approach, arguing that in the 1700s many treaties were purported to be "perpetual", but this did not preclude either side from bringing the agreement to an end thus "perpetual" only means that there is no built-in sunset provision. For example, the Treaty of Paris called for a "perpetual peace" between Great Britain and the United States, but less than three decades later the two nations warred again in the War of 1812. ^ Lincoln, Abraham (March 4, 1861). "Abraham Lincoln's First Inaugural Address on March 4, 1861". AMDOCS: Documents for the Study of American History. Retrieved October 27, 2009. ^ "History of Brittany". Retrieved 2009-11-03. ^ "Caesars coins". Retrieved 2011-06-13. ^ "Ratification of the Constitution by the State of Virginia". Virginia. June 26, 1788. Retrieved January 5, 2016. ^ Madison, James (July 20, 1788). "Letter to Alexander Hamilton". Archived from the original on April 12, 2001. Retrieved April 12, 2001. ^ Marshall L. DeRosa, ed. (1998). "Preserve the Union". The Politics of Dissolution. Transaction Publishers. pp. 58–59. Retrieved January 5, 2016. ^ a b Amar, Akhil Reed (September 19, 2005). "Conventional Wisdom". New York Times. Archived from the original on May 29, 2015. Retrieved May 29, 2015. Also located here. ^ Forrest McDonald, Novus Ordo Seclorum: The Intellectual Origins of the Constitution, University Press of Kansas, Lawrence, Kansas: 1985, 281. ^ Washington, George (1789). "First Inaugural Address". ^ Washington, George (1796). "Washington's Farewell Address". ^ Henry, William Wirt (1891). Patrick Henry: Life, Correspondences and Speeches. 2. pp. 609–610. ^ Kevin Gutzman, The Politically Incorrect Guide to the Constitution, Regency Publishing, Inc., Washington D.C.: 2007, 12. Wikimedia Commons has media related to Articles of Confederation and Perpetual Union.